UPV/EHU-University of the Basque Country researchers have explored superelasticity properties on a nanometric scale based on shearing an alloy's pillars down to nanometric size. In the article published in Nature Nanotechnology, the researchers found that below one micron in diameter, the material behaves differently and requires much higher stress for it to be deformed. This superelastic behaviour is opening up new channels in the application of microsystems involving flexible electronics and microsystems that can be implanted into the human body. Superelasticity is a physical property by which it is possible to deform a material by up to 10 percent, which is much higher than that of elasticity. So when stress is applied to a straight rod, it can form a U-shape, and when the stress is removed, the rod resumes its original shape. Although this has been proven in macroscopic materials, no one had previously been able to explore these superelasticity properties in micrometric and nanometric sizes, according to José María San Juan, lead researcher of the article published by Nature Nanotechnology and a UPV/EHU professor. Researchers in the UPV/EHU's Department of Condensed Matter Physics and Applied Physics II have observed that the superelastic effect is maintained in small devices in a copper-aluminium-nickel alloy—Cu-14Al-4Ni, an alloy that displays superelasticity in ambient temperature. The researchers used a piece of equipment known as a focused ion beam. "It's an ion cannon that acts as a kind of atomic knife that shears the material," explains San Juan. The researchers built micropillars and nanopillars of this alloy with diameters ranging between 2 μm and 260 nm. They applied stress using a sophisticated instrument known as a nanoindenter, which allows extremely small forces to be applied, and then they measured the behaviour. The researchers have for the first time confirmed and quantified that in diameters of less than a micrometre there is a considerable change in the properties relating to the critical stress for superelasticity. "The material starts to behave differently and needs a much higher stress for this to take place. The alloy continues to display superelasticity but for much higher stresses." San Juan highlights the novelty of this increase in critical stress linked to size, and also stresses that they have been able to explain the reason for this change in behaviour. "We have proposed an atomic model that illuminates why and how the atomic structure of these pillars changes when a stress is applied." 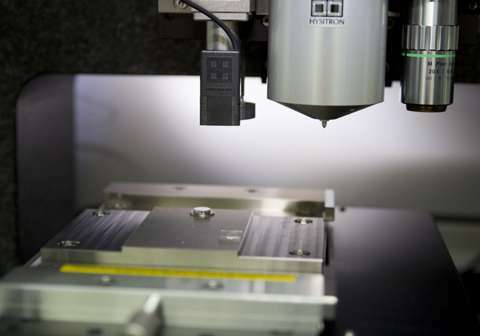 The UPV/EHU professor highlighted the importance of this discovery, which opens up new channels in the design of strategies for applying alloys with shape memory to develop flexible microsystems and electromechanical nanosystems. "Flexible electronics are being increasingly used in garments, sports footwear, and in various displays." He also said that all this is of crucial importance in developing lab-on-a chip health care devices that can be implanted into the human body. "It will be possible to build tiny micropumps or microactuators that can be implanted on a chip, and which will allow a substance to be released and regulated inside the human body for a range of medical treatments."